This dish calls for several cups of fresh herbs - perfect for when herb gardens are flourishing with an overabundance! Based on a Persian dish called Kuku Sabzi (similar to a frittata, but super-packed with herbs), our variation includes several different fresh herbs, and is baked in a mini muffin pan. 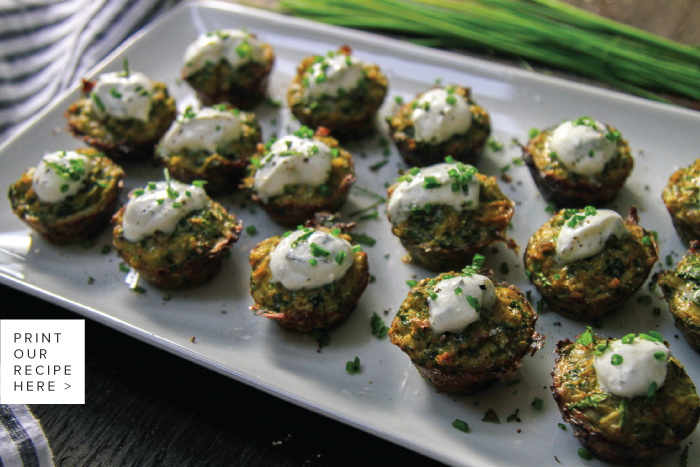 Topped with a simple yogurt sauce, and some fresh chives as a garnish, these savory bites work well as a brunch or dinner appetizer. Alternatively, bake in skillet or baker, and make this dish the whole meal! 1. Preheat the oven to 400 °F. Add 3 tablespoons of olive oil to a large skillet and sauté the leeks, garlic, and fennel on medium heat until translucent. 2. Meanwhile, whisk together the eggs, salt, baking powder, pepper, and turmeric. 3. In a food processor, pulse the cilantro, dill, parsley, and walnuts together until well minced. Add the minced herbs and nuts to the beaten egg mixture. Fold in the sauteed leeks, garlic and fennel mixture. 4. Fill 2 non-stick mini muffin pans (24 wells each) with the mixture (or bake in batches). Be sure to fill the mixture to the top; the bites will rise only slightly. 6. While the bites are baking, mix together the yogurt ingredients and serve with a dollop topping each bite. Garnish with the chives, and enjoy!